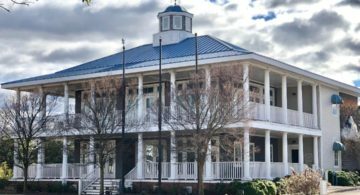 Deadline Brewing Project is a brand new “nanobrewery” in Virginia Beach near the intersection of West Great Neck Road and Shore Drive. Anchored by two television news reporters and one former print journalist, Deadline’s grand opening was just a few news cycles ago on September 29. 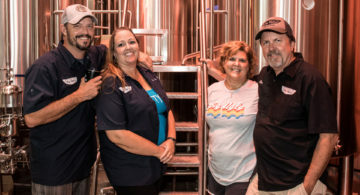 With the Lynnhaven Pub a short walk up the street, Pleasure House Brewing just a few blocks west, and Commonwealth Brewing a couple of miles away at Chic’s Beach, northeastern Virginia Beach is turning into a real beer destination. As the Chesapeake Bay is just a block away both locals and visitors now have a Deadline they will be eager to meet on their way to or from the beach. So, what’s a nanobrewery? A very small brewery. They make their beers using a two-barrel (62 gallon) system. The upside of a two-barrel system? You’re in the brewing game at a fraction of the cost of something larger, and you aren’t going to be married to any particular run or recipe since the quantity produced will be very small. This makes it easy to brew a lot of different beers and vary your offerings regularly. The downside? You’re going to be brewing a lot to keep up with demand! 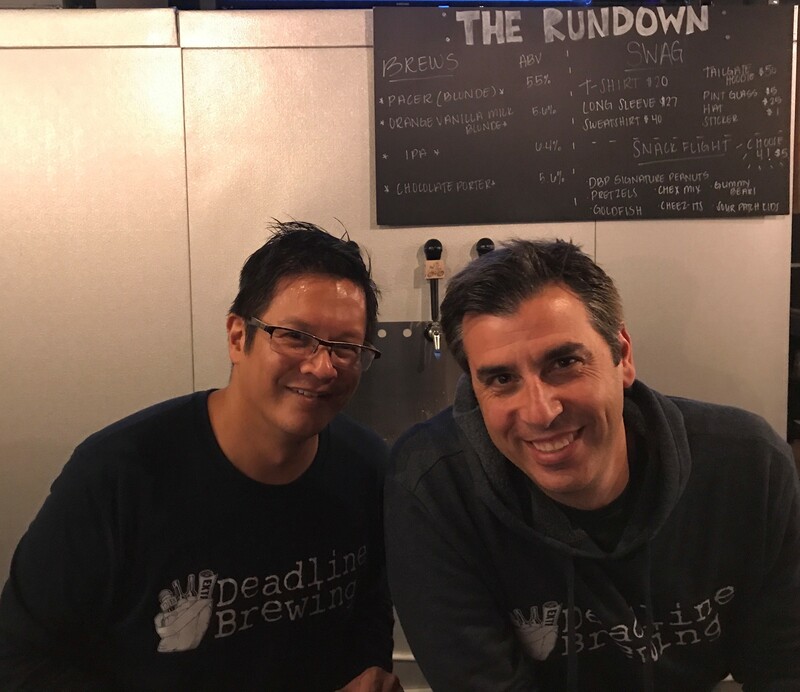 The brews team at Deadline consists of Jason Marks (WAVY-TV 10), Erica Greenway (WTKR-News 3) and Darrell Cuenca, a former writer for the Virginian-Pilot. They started the build-out of this facility in March and six months later they have opened for business. Darrell, who will be head brewer, learned his brewing licks at Big Ugly Brewing in Chesapeake. He told us he plans to brew five days a week. The tasting room will only be open Fridays and Saturdays at first; hours will be expanded soon. The tasting room features four taps (so far), a large pine bar with a shiny epoxy finish, and walls decorated with blow-ups of noteworthy headlines (“Man Walks on Moon!”) and quotes by journalists ranging from Barbara Walters to the gonzo Hunter S. Thompson. Peek around the corner and you will see the brewing and fermenting vessels, small but sturdy workhorses that will convert malt, hops, and yeast into liquid refreshment, which in turn converts staid imbibers into masters of happy talk. So what kind of beers do these newsworthy folks make? Well, for their grand opening there were four offerings on tap. There was probably a lot of “efforting” to get them cued up for opening day – all were very clean, crisp and tasty, if mildly undercarbonated. Their house yeast is a Chico ale yeast (homebrewers out there know this refers to Wyeast 1056 American Ale yeast, not Chico Escuela, the fictitious New York Met), a versatile yeast that can be used to ferment a lot of different styles. Maybe it is like Mr. Escuela? Perhaps it’s the utility infielder of yeast? OK, cut to the beer. Pacer, a blonde, is a delicious beginning for your four-draft flight. 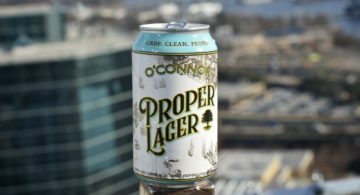 Coming in at 5.5% ABV, it’s light, refreshing and easy to drink. Next, cue up the Orange Vanilla Milk Blonde, 5.6% ABV, a mélange of flavors perfectly spliced into a light flavorful beer with an appealing creamsicle aroma. These two beers were an excellent lead-in for the next two which are “above the fold” with bolder flavor profiles. The Chocolate Porter, 5.6% ABV, has a dark roasted malt character, mild bitterness, and is made with cocoa nibs from Colombia. Aromatic and attention-getting, this isn’t a Hershey’s type of confection, it’s more like a semi-sweet nonpareil, but without the nonpareil. Would that be a non-nonpariel? 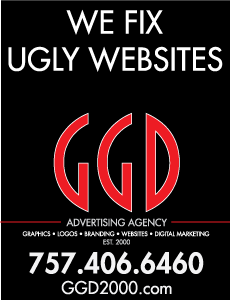 In any case, it is unparalleled. And finally, the wrap-up, their IPA. A bump-up in alcohol from their other offerings, somebody robbed the hop bank and stashed the loot in this keg. All late addition hops means lots of hops flavor and a lighter hops bitterness. Dry-hopped with two pounds of Citra and Falconer’s Flight hops per barrel, it tastes like a Shore Drive interpretation of a New England IPA with tropical and juicy notes. 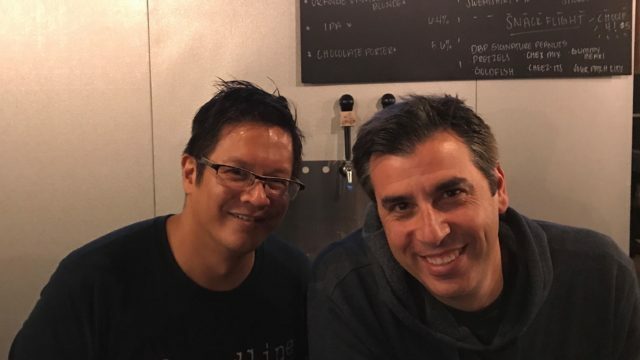 The Deadline game plan is to rotate their product line, eventually brewing a Saison, a wheat beer, and some alternative IPA recipes, as well as expanding the number of taps. For now, the beers are only available in the tasting room, Fridays 5 – 11 pm and Saturdays noon – 11 pm. 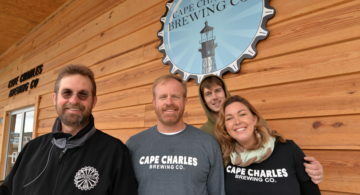 In other news, we are very excited about two new brewpubs opening soon in Hampton Roads. The Vanguard will be opening in Hampton’s historic former Armory Building on December 9. It will be Virginia’s first brewpub-distillery and a music venue to boot. The Amber Ox Kitchen & Brewery is scheduled to open in mid-December in Williamsburg’s historic district. It will feature house-brewed and regional craft beers and a chef-driven menu featuring locally sourced products and beer-and-food pairings. We will be writing about these two promising new venues in upcoming issues of VEER.